Chased to the depths of the bottomless blue,What does a tiny Jellyfish do? Jellyfish is quietly crooning in the shallows, when knife-nosed Swordfish swooshes, races and chases her, down, down, down, deep into the dark blue sea. At that moment, stealthy Squid stretches a tentacle,... read full description below. A captivating bedtime story by award-winning picture book creator Ruth Paul, with luminous illustrations, language evocative of the deep blue sea - and a big surprise when you turn out the lights.Chased to the depths of the bottomless blue,What does a tiny Jellyfish do?Jellyfish is quietly crooning in the shallows, when knife-nosed Swordfish swooshes, races and chases her, down, down, down, deep into the dark blue sea.At that moment, stealthy Squid stretches a tentacle, tussling and tossing Swordfish in the darkness. Who will help Swordfish? He makes a last wish...Then ...ON goes a light - it's Jellyfish!This delightfully funny bedtime story by an award-winning writer and illustrator has a glow-in-the-dark cover for kids to discover once the lights are turned out. Ruth Paul lives in an off-grid, straw-bale house on a farm just outside Wellington, New Zealand. As well as writing and illustrating children's picture books, Ruth has worked as a costume illustrator for Peter Jackson movies. She has two teenaged sons and is actively involved in her local community, having previously chaired her local Community Board and School Board of Trustees. Over the years, Ruth achieved a Bachelor of Arts majoring in English and History from Victoria University, a Diploma in Visual Communication Design from Wellington Polytech (now Massey University), and most of a law degree. 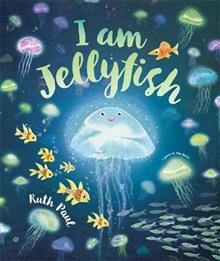 Ruth started writing and illustrating her own picture books in 2004, and has created over 15 titles. The King's Bubbles won the NZ Post Children's Choice picture book award in 2008, and three of her books have made the Storylines Notable Book list over the years. Stomp was a finalist in the NZ Post Book Awards 2012, and Bad Dog Flash was selected for the US Kid's Indie Next List in 2014. I Am Jellyfish, a literally luminous story with its glow-in-the-dark cover, won Best Picture Book at the New Zealand Book Awards for Children and Young Adults in 2018. The judges were full of praise, noting that 'The text and illustration perfectly complement each other in this humour-filled tale of small but mighty...This is a book for all the unsung small heroes and it will be giggled over and read again and again.' Ruth's books have sold in New Zealand, Australia, USA, Canada, the UK, China and Korea, with translations in five languages. Her original picture book illustrations have contributed to touring exhibitions for Painted Stories (previously Te Tai Tamariki Trust) and two are held in the prestigious Mazza Collection at the University of Findlay, Ohio. She says every new book is a challenge and presents the opportunity to get better at the craft she wholeheartedly loves.